46″ discharge height with 18″ reach. 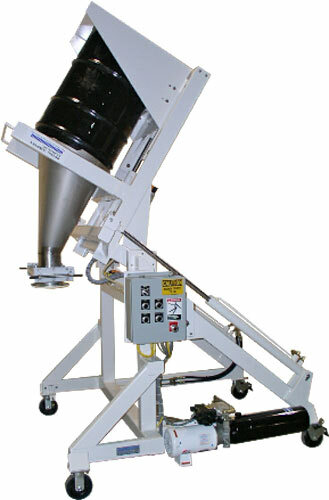 Flat bottom skip accepts drums of sugar, then discharges material into a flexible screw conveyor inlet hopper. Dumper frame includes clevis type locating system to ensure reliable sealing to conveyor hopper cover inlet. 6″ diameter dust-tight manually actuated orifice gate at cone discharge. Pivot carriage rotates on 2″ diameter piloted flange bearings. Carbon steel cleaned, primed, and painted FDA Dairy White epoxy. Completely self-contained 2 GPM hydraulic system. Side mounted pivot cylinders for excellent rotational control. NEMA 4 electricals mounted in a watertight carbon steel Hoffman enclosure. Auto/manual mode controls with lighted, mushroom head emergency stop button.